Many of our students write and ask “how to rescore your TOEFL?”. You studied for what seemed like forever, took your TOEFL iBT, waited patiently for your score to arrive (7-10 days for most people), and when you finally open the envelope to see your TOEFL iBT score, you’re disappointed with the results. You didn’t get the TOEFL score you wanted, especially the TOEFL Speaking and Writing section. What’s even worse is that you felt you really did a good job on both of them. So, what can you do? Can you rescore your TOEFL? If you don’t like your TOEFL iBT score on the Speaking or the Writing section, you can appeal – or rescore your TOEFL (“appeal” means to formally ask for a request, usually against a previous decision). In other words. If you don’t like your score on those specific sections you can ask for the TOEFL iBT graders to look at your exam again and rescore it. 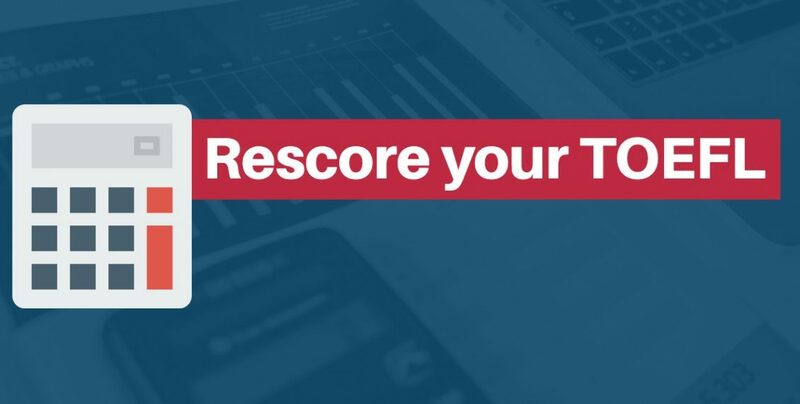 According to the TOEFL iBT official page, you can request a rescore up to 30 days after your test date. This means you should apply for the rescore pretty quickly after you receive your scores, as 30 days isn’t a lot of time. “Yes, you can request a score review up to 30 days after your test date. There is a bit of bad news in there, I’m afraid. As you can see, to have the TOEFL graders rescore EITHER the Speaking section OR the Writing section costs US $80. If you want to have them both rescored it costs US $160. If you’re thinking, “Hmmm. That sounds like a lot of money”, that’s probably because it is. In fact, it’s pretty close to what you would pay to retake the test completely. Also, and here’s another negative point, your test cannot be rescored if you have already asked ETS to send your TOEFL scores to a specific school or institution. I personally think it’s a good idea if you were CERTAIN that your test was poorly scored. But how often are we CERTAIN about a test? A better way to look at it is that now you know what parts of the test to focus on, and where you can really improve. There are many ways improve on your Speaking and Writing sections on the TOEFL iBT. Be sure to read and study all of English Simple’s TOEFL Speaking strategy and practice material. TOEFL STUDY + PRACTICE. IMMEDIATE ACCESS - STUDY UNTIL YOU PASS. Get TOEFL Strategy - Tools - Practice with our full TOEFL program. The English Simple TOEFL program gives you strategy specific tools and lessons to master each section of the TOEFL. We also answer questions and create lessons for your specific needs. Even more, it’s simple. What ever you do to prepare for the TOEFL iBT, Good luck, and keep it simple.